Aman Vohra did his schooling from Dehradun and then did his graduation from DAV. He was always interested in fitness and therefore started participating in Power Lifting. He has been a Gold Medalist at State Level for last 4 years and has won a Gold Medal in International Deadlift Championship in 2016. 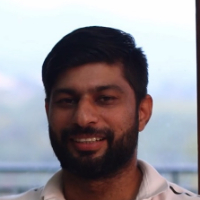 He is the Director and Fitness Trainer of Sportsfit by MS Dhoni, Dehradun. Powerlifting is a strength sport that consists of three attempts at maximal weight on three lifts: squat, bench press, and deadlift. It involves the athlete attempting a maximal weight single lift of a barbell loaded with weight plates. "I did B Sc from DAV College. I was always interested in fitness and therefore started participating in Power Lifting competitions. I have been a Gold Medalist at State Level for last 4 years. I won a Gold Medal in International Deadlift Championship in 2016 and have also been in Top 5 in the Nationals. I am the Director at Sportsfit by MS Dhoni, Dehradun." "After doing my schooling from Scholars Home, I did my B Sc from DAV. I was always interested in fitness and therefore started participating in Power Lifting. I have been a Gold Medalist at State Level for last 4 years and have won a Gold Medal in International Deadlift Championship in 2016. I am the Director and Fitness Trainer of Sportsfit by MS Dhoni, Dehradun."